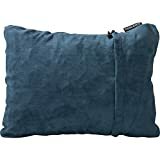 The Therm-a-Rest Compressible is our pick for the best compressible pillow, which can be used in an airplane, for road traveling, for camping and the like. It measures 4 inches in thickness and it is available in 5 colors and sizes. The cover is made with polyester material. Our step-up pick is the Sea To Summit and it is made with a soft polyester knit cover that is at 50-denier in quality. There are baffles in the construction so that it is very contouring to your head when you sleep. You can use it in a chair or on a bed. The budget pick is the Compact Technologies Travel and it is very compact in size and can be easily packed and rolled for traveling. It is made with fleece material so it tends to be very soft to lay on. It also comes with a free carabiner. A pillow is usually located in a bedroom. Aside from a bed, there are many other locations for this kind of item, such as chairs, couches and automobile interiors. This item can come in many forms. For instance, on chairs and couches, you can find ones in different shapes other than square and rectangles, such as triangles, circles and various other forms. The common filler for this kind of item can be foam, feather, down, synthetic fibers, latex and many more. Back in the days, these kinds of items were filled with straws. Cotton can also be used in some countries where applicable. Fillers vary depending on the size and the weather or climate in your area. For instance, cotton is applicable for hot climates while down and feather are ideal for cold weather. Orthopedic types are usually shaped differently and can be either made for surgery purposes or for pregnant women. The most popular one is the u-shaped one that is for travelling. Orthopedic types are super popular today because of their comfort levels. Decorative types are ideal for adding more accent to your home or area. They can be placed in your couch or sofa and they all look unique from each other. They can have different colors and materials for the exterior so they can be attractive. There are also special materials that are used by other manufacturers, such as memory foam for therapeutic purposes. Hypoallergenic materials can also be used, as well as buckwheat hull in some occasions. There are endless possibilities when it comes down to the material choice and it can vary depending on where you live and the customary traditions in your area. Size: the right size for your needs should be met. There are many varieties to choose from, such as those for beds, those for decorative purposes and for traveling. The most likely size you will pick would be the one that is easy to pack and not too big or bulky. Smaller ones are usually around 15 to 30 inches while anything that is bigger than that is mostly for a large bed. Material for the filling: you have to consider what filling it has. Something that can be compressed should have a durable build and yet will not sacrifice comfort at all. While it is true that most of these compressible items will be made of synthetic material, they should at least be comfortable to sleep on so that your overall comfort does not get compromised. Common materials for the filling include memory foam, polyester and polyester blend. The benefits of memory foam include the fact that it supports with comfort due to its conforming ability to your head. Polyester and blends of it are great for added resilience against punctures and the like. Other fills that are made of synthetic material can be great for added protection. Ease of packing: consider one that is easy to pack so that you will have less of a trouble later on. It should be simple enough to compress, especially if it is a large size, and could fit well into your bag of choice. The reason that it is compressible is that it is made of material that can be packed flat for your luggage and fluffed up when it is ready to be used. Material for the cover: consider one that has a good cover. While bamboo rayon ones are the most popular type, you should check first if it is an eco friendly version of the material or product. You can also consider polyester or nylon for durability and stain resistance, or satin and silk for a smooth feeling when sleeping on them. Reversible covers are also good. Common materials for the cover include velvet and rayon derived from bamboo. While rayon is okay, you should look at the tag and the materials to make sure that it is eco friendly in its construction and it if smells nice. Velvet is a more expensive type of material but it is very good for your skin with its silky and smooth feel. Hypoallergenic: not everyone is good with all kinds of filling materials and cover materials out there, so you should consider one that is safe for sensitive skin in order not to get harsh allergies. In addition to that, one that does not easily catch dust mites, pet dander, mold and mildew will be worth the purchase because they will be much easier to clean overall. Shape: there comes many kinds of shapes depending on what you intend to use them for. Most can be those horseshoe shaped types or the u-shaped travel pillows while others can be other types of orthopedic ones, such as wedges, long hugging or those for pregnancy purposes. Some can also be meant for sleep apnea or other sleeping disorders and discomfort. Some are also stylized to achieve a certain effect or design for decorative purposes, but can still be usable. Intended use: some of them are meant for simply traveling but some of them can also be used for camping and backpacking. You should choose the appropriate material depending on where you will use it, as something that is merely for the airplane or bus won’t do while you are in a tent that sits in the middle of the wilderness and can be prone to wear and tear from the elements and ground. As our top pick, the Therm-a-Rest Compressible comes in 5 color and pattern choices and measures 4 inches in its thickness. It is great for plane traveling, road trips, commuting and simple camping trips. It is made with a soft polyester cover that can be easily brushed against your skin. The only con but not a deal breaker with the Therm-a-Rest Compressible is that it may be too bulky for backpacking, so you may want to consider a smaller item for that. The Sea To Summit is our step-up pick, which is made with a synthetic fill, a TPU bladder and a polyester knit case that has 50-denier quality. It can be easily inflated and compressed later on when not in use and it comes in green and blue. For our budget pick, the Compact Technologies Travel is made with shredded memory foam filling. It measures 10 x 15 inches with a thickness of 5 inches in its size. It is made with quality fleece fabric and it can be easily rolled when not in use. The PelloPillow ULTIMATE has a u-shaped design and is available in 5 colors. It is easy to wash and easy to pack and can be used by commuters and travelers alike. It takes 30 to 45 seconds to easily set it up and it can be compressed into any small bag or backpack. The LEKEA Travel Inflatable has an adjustable height and you can choose from either an m-shaped or u-shaped design. It also comes with free ear plugs, sleeping mask and a pouch. It gives full support for your head and neck. The Z by MALOUF is made with memory foam for its interior filling and velour for its outer cover. It uses a unique open cell technology, which makes it much more breathable compared to other memory foam type items out there. It is also good at keeping body heat away and it has a 5 year warranty. 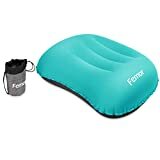 For camping, the FEMOR Ultralight Inflating has an ergonomic look and a compact design that can be used anywhere while you are traveling. It can also act as a support for your lumbar area other than for your neck and head. It has a warranty of 18 months. The Amokin Ultralight is great for traveling and is also ideal for the beach. It has a width of 8 inches and has an anti-slip fabric cover. It is very lightweight to carry around and comes in three colors: blue, red and gray. It can be easily inflated and then compressed later on when not in use. The Zura Energy Inflatable is lightweight enough for backpacking as well as for beach trips. It comes with a carabineer as well as other freebies and can also be taken to hiking trips. It is very lightweight at 2 ounces and has an ergonomic design. The ATailorBird Inflatable is a good choice for daily commutes or even for far traveling. 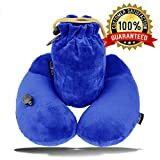 It comes with a traveling bag and is great for supporting your neck. Being easy to clean, it has a fabric cover made from micro velvet. Others were not in this list because they had trouble with packing up and with fluffing them again. It is also important that even if it is a synthetically made product or item, it should not have foul chemical smells and should be made with skin friendly products while being packable. Q: What are the benefits of packable or compressible pillows? 1. They can be packed for travel use. 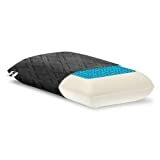 One of the best things to know about this kind of pillow is that it can be used to take with you to traveling. It is very packable and it is easy to fit into your bag or luggage. Since they can be sandwiched between clothes due to their flat and packable nature, they tend to be much easier to carry along with you even if they are large in their size. 2. They can be easy to clean. Because they tend to be easy to pack, they also tend to be simple to toss into the washing machine. However, be careful when you look at the different materials, as some other materials cannot be easily tossed into the washing machine. However, most of them are easily washable so you can worry less about having to keep them clean. An added bonus is that some synthetic materials are stain resistant. 3. They tend to be durable in material. Because they are meant for traveling, they are mostly made from quality materials so they are less likely to fail you while you are on the go. 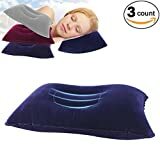 Most materials used for this sleeping item are made of synthetic materials so that you will feel assured that they will be somewhat tear resistant along the way. This is why they can be taken with you while traveling, and maybe even for camping. Q: How do I protect them while travelling? They can be great for protection. Too much oils can wear them down. You can protect your head oils from reaching into the pillow. Dry your hair thoroughly first before using these items. Q: What are the kinds of fills for them? a. It can be molded depending on the shape of your head so it is comfortable. b. It is very durable compared to other items. c. It has a lightweight feel so it can be comfortable compared to feathers. a. The cleaning process can be difficult when it comes down to it. b. Many people might complain that it might lack a lot of support. c. Body heat can be retained so it is not good for hot climates. d. The price tag can be too much for some people. e. Fluffing it is a chore for most people. a. This is usually a cheaper option when it comes down to fill materials. b. The fact that it can be molded to any shape that you want means that it is comfortable. c. It is easy to cuddle and is very lightweight to carry. a. It might be more prone to bad odors compared to down material. b. Quills might pluck you in the middle of the night. c. Fluffing might be necessary more than ever. d. Cleaning it can be a chore for most people. e. Like down, it is only intended for cold climates. a. It is a super cheap option if you cannot afford either down or feather fill. b. It does not hold too much weight at hand so it is very travel friendly. c. Cleaning this kind of material is such a breeze. a. It might not be that breathable compared to other materials. b. When not supervised, the materials could be harmful to the environment and to your health in the long run. c. Clumping can form because of its materials. d. Durability might not always stay the same. e. Its molding ability is not like down or feather types. a. It resolves the problem of clumping that is found on polyester fills. b. It gives you a lot of support because of its construction and material. c. It conforms and contours to your body to provide the best kind of comfort possible from it. a. It may smell weird if you purchase a lower quality brand of this item. b. It might soften so it is not very good for total support in long term use. c. Off-gassing can potentially happen and can be something harmful. a. It is super organic so it is environmentally okay and eco friendly compared to other types of materials. b. It helps when it comes down to air circulation so you won’t feel hot unlike with other types of materials out there. c. The support and shape is retained all throughout your sleeping experience. d. It can have benefits for your neck and your head. e. They tend to be very durable than most materials. a. The noise it creates can be quite a nuisance for some people. b. They tend to be big and heavy compared to other materials. c. They can be too firm to sleep on, according to some people. a. Microbeads are great for adding breathability when you sleep at night, especially for really hot nights and summers. b. They tend to hold shape and will not easily lose support over time. c. They can be easily molded and contoured to your neck and head. a. The firmness and loft stays throughout its usage and cannot be adjusted. b. Off-gassing can occur because it is made with man-made material. c. It may not be as durable as other types of materials out there. a. They are eco-friendly because latex is sustainably harvested from plants and is not man-made. b. The molding ability of this kind of fill is good. c. The breathability is okay but better compared to microbeads as well as buckwheat fills. a. The odor can be bad even if it is natural latex. b. The softness might not be enough for some people who want added support for their head. c. The price might not be that friendly for some people who are on a tight budget. a. Its eco-friendliness is very good because it is sourced from a plant that is native to Mexico. b. Compared to synthetic materials, it is free from harmful chemicals and substances that could affect your health and the environment as well. c. The texture is just right and can act as a dupe or replacement for down or foam fill. a. Molding cannot be replicated compared to foam or down. b. Lumps may happen as with polyester fill. c. It can catch fire so be wary of using it around the house and keep it away from flammable materials. Q: What are the kinds of fabrics for their cover? 1. Down and feather proof – these are meant for protecting a down or feather pillow because of their delicate nature. Because of the fact that the quill in feathers might poke through, which can be uncomfortable for most people, these covers are heavy duty and can be easily cleaned as well. 2. Cotton – if you want something that is highly breathable then we recommend cotton fabric because of its ability to keep your skin as cool as possible during the summer season. It is not just breathable but it is also natural. 3. Polyester – if you want something that is relatively easy to wash and almost stain resistant, you can go for polyester fabric. It is not that cool when it comes down breathability, but combining it with cotton and other similar and comfortable materials can give it a boost when it comes down to summer night cooling abilities. 4. Bamboo derived rayon – this is very popular today because of their hypoallergenic qualities. They are similar to various kinds of moisture wicking fabrics out there and they can be easily seen on most memory foam fills and the like. They may also have antibacterial and anti odor properties, which can be important if the sleeping area tends to smell bad due to overuse or because of the weather and climate. 5.Tencel – this is also another popular type of material and is also eco friendly, much like cotton. It wicks moisture away, so it is good for those sweaty nights. It is also odor absorbing so it will not smell bad for a long period of time. It also makes your skin okay because of its hypoallergenic properties. It also comes from plants like cotton and has a softer feel compared to cotton. Q: Why should I get a hypoallergenic one? 1. It is much friendlier to those with allergies to certain materials. Allergies could happen for people with sensitive skin. Certain materials could have irritants, especially those with manmade materials. 2. It does not give off a bad smell. The smell that comes from the material should be decent and should not smell alarming. Any chemical or plastic like smell can certainly put off people when they sleep on it. This is why it is important that it is hypoallergenic to avoid this kind of problem. 3. You will be safe from skin irritation and the like. Irritation can happen to anyone, regardless of your skin type. Any kind of material that might be unknown when it comes down to composition might harm your skin and cause irritation sooner or later, especially when you sweat or use night creams. 1. You tend to sneeze a lot in your bed or sleeping area. 2. You cough or wheeze a lot due to the dust. 3. You tend to get watery eyes along with sneezing. 4. Congestion could happen in a worse way compared to before. 5. It’s harder for you to breathe properly compared to your usual routine. 6. Bug bites might make your experience uncomfortable when you are sleeping. 7. Your nose tends to get stuffed all the time in the bed. 8. A damp moisture could be felt in your bedding item, indicating mold and the like. Q: What is the difference between a cotton and a polyester cover? A: A cotton and a polyester cover can both be cheap and are sometimes combined with each other. They are also used in clothing, other than in bedding. This one has a softer feel so it is gentle on your skin. This one has a rougher feel because of it is man-made properties. It mixes both the softness and resilience of the two. Cotton is the best when it comes down to breathability. Polyester may not be that much when it comes down to breathability. Cotton and polyester blends can be slightly more breathable than polyester alone. Cotton tends to break easier than polyester. Polyester is what you’ll want to look for when it comes down to durability. You get the best of both worlds so your blend is slightly stronger. Dying cotton is the easiest thing, but fading is another thing. Polyester may be difficult to dye but it can be more resilient when it comes down to the colors fading. This one is really fade resistant because it mixes the two together. It may tend to wrinkle when not handled properly. These do not wrinkle that much compared to cotton. These can wrinkle but not as much as cotton and more like polyester. Might be prone to shrinking. This blend comes with less shrinkage. Cotton tends to be a little pricier than polyester, but still cheap. Polyester is the cheapest of all. This one can be cheap as well, because it is a blend of the two materials. Cotton is eco friendly, since it is made from plants. It is man-made so it may not be eco friendly. Combining the two can make them slightly eco-friendly. Q: How are memory foam and latex different from each other? They tend to be soft and contour to your body, so they make you feel like you are floating. They tend to be rubbery and are ideal for those who want a firm thing to lay on. They are more suited for those who can relieve their pressure using a conforming item to their head. These are more suited for those who want more firmness for their head. Memory foam does not spring back when you lay down on it, so it is less responsive in this case. Since it is rubbery, it tends to be more responsive and bounces back. This is where memory foam is the best at. Latex can still distribute some movements. Usually very hot, unless you have a cooling version of the memory foam item. Usually very hot as well, but could have a secondary cooling layer. Pretty durable when taken care of properly. Also very durable but can wear out over time. Memory foam is usually the same anywhere. Some latex are synthetic and some are man-made. Let’s face it, memory foam is expensive, but not as expensive as latex. Latex tends to be pricier than memory foam, especially if it is legit. Q: What are the benefits of silk for covering? A. They tend to be softer for your skin. These covers are super soft, silky and smooth that you would not have to worry about the bad effects of rough and brittle fabrics that feel unpleasant on your skin. B. They tend to be softer for your hair for less split ends. Having a bad hair day can sometimes be blamed upon the type of fabric that is used for your kind of bedding item. This is why it pays to choose and invest in something softer so that it may not pull your hair and potentially cause split ends and the like. C. They provide some insulation at night when it is cold. The softness of silk can sometimes be an insulating material like satin and others, making them ideal for nights where the wind is kind of chilly or cold, so that you do not compromise on the comfort of your sleep. D. They offer a very luxurious feel when you sleep or rest. This luxurious feel is something that can make you feel pleasant and happy. If you want to prepare a room for guests who are expecting a touch of luxury then there is no better way of doing it than using luxurious fabrics like silk. E. They are very eco-friendly because they are made from natural materials. Silk is produced by silkworms, which makes them friendly to your skin and to the environment unlike man-made materials. Q: How does satin benefit your pillow as a case? 1. It makes your face less prone to temporary creases when sleeping. 2. It makes your hair less frizzy and reduces static. 3. Your eyelashes could get protected with satin. 4. Your pores and skin quality can benefit from its breathability. Q: What are the advantages of travel pillows? 1. 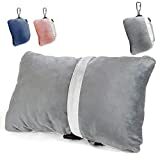 Stiff necks – these can happen while you travel and when you sleep on a vehicle, so it is important to have a supportive item so that you will not have stiff neck later on while traveling or commuting. 2. Sleep quality – because it helps to support your neck, back and posture while you sleep, it helps you to have a deep sleep even while on the bus, airplane or any kind or form of transportation. 3. Overall posture – your posture can also be improved if you use this kind of sleeping item while you are travelling because it helps you to align your spine and your neck without causing discomfort. Q: Which color combinations for pillows work best? Q: What is bamboo derived rayon? A: Bamboo derived rayon is processed material that comes from the cellulose material of the plant and is dissolved into making fabrics. Bamboo derived rayon is a commonly marketed product material for most beddings and the like. The only problem with rayon is that the process to make it may not always be eco friendly. The process involves carbon disulfide, when it comes down to dissolving the fiber and spinning it into threads. This carbon disulfide can be a harsh chemical not just to humans but also to the environment. Therefore, you should think twice before purchasing any cover made of rayon, or you can consider Tencel as an alternative because it comes from the eucalyptus tree, in which the process is usually much eco friendlier than that of bamboo derived rayon. Q: What are the advantages of linen covers? 1. Therapeutic – because of its microscopic breaks, it gives you a little bit of massage, which can be good for blood circulation and for a healthy skin. 2. Breathability – linen is especially good for hot climates because it has good breathability. You can use it for the summer and it can also help keep you warm in the winter. 3. Moisture wicking – the fact that it can wick away moisture is important for people who tend to sweat a lot at night. It is also helpful for those nights that are very hot, such as in the days of summer. 4. Unique texture – there is nothing like the texture of linen that cannot be simply replicated by other kinds of fabrics out there. This is why it is always sought out by many as a good bedding product. 5. Stain resistant – being resistant to stains and dirt can make it easier for you to take care of your bedding product, which is important for those who are living busy lifestyles. 6. Durability – compared to cotton, it is usually much durable because of its construction. This means that it can last longer compared to other materials. 7. No static – having no static makes it much friendlier for your skin and for your hair. It also means that it will be a much more comfortable material to handle. 8. Gentle for your skin – because of its natural and organic construction, it is very gentle for your skin. It will less likely cause irritations and the like. 9. Eco-friendliness – because it is made out of quality and sustainable material that comes from the linseed or flax plant, it is eco friendly in its way. 10. Luxury – anything that is made of linen is considered a symbol of luxury nowadays, because linen is getting harder and harder to produce due to the costs and the difficulty of finding the plant. Q: What are the advantages of synthetic covers? Q: How do I make sure my pillow is eco friendly? Q: What are the different shapes to choose from? Q: What are the benefits of a long body pillow? 1. It can relieve your body aches. 2. It can also support your neck. 3. It is good for side sleepers. Q: What sizes are available for standard bed pillows? Q: Why are pillows important for travelling? A: They add to comfort to your traveling experience and they also help you maintain a good posture and to your sleep health. They can also help you to stay comfortable no matter the condition. Adding a little bit of comfort while you are on the go helps you to have a good experience during vacation and travels. Q: How do I wash these packable compressible items? 1. Wash its protector and/or cover separately. 2. Use mild detergent for washing it. 3. Know from the instructions if machine washing and/or dryer use is okay. 4. Use tennis balls for fluffing them in the dryer. Overall, the Therm-a-Rest Compressible is our pick for the best compressible pillow due to the just-right thickness, wide range of designs and durable cover material.